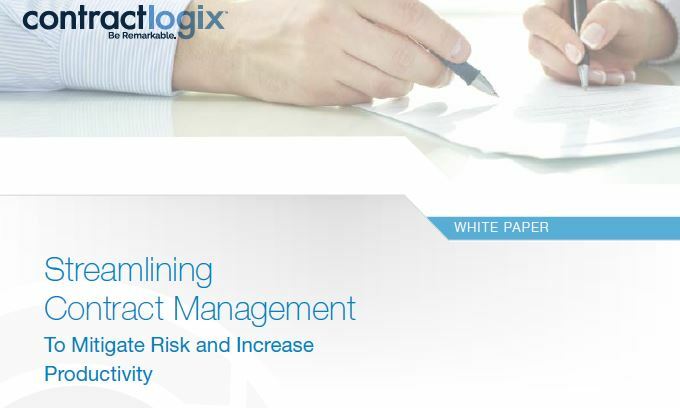 Streamlining Contract Management to Mitigate Risk & Increase Productivity. Many professionals believe the contracting process only consists of creation, negotiation, approval and storage. In fact, the process has one more critical step — the actual ongoing contract MANAGEMENT process. In this whitepaper, you’ll learn how to automate and streamline the management of your contracts. It covers the process from conception to approval, workflow to renewal, and everything in between. You’ll learn how to ensure you never miss an imortat contract date or deadline. You’ll learn to prepared should you ever face a contract compliance audit. And you’ll learn how to say goodbye to your old, disorganized filing cabinet to minimize your risk! Complete the form at right to download your copy of Streamlining Contract Management to Mitigate Risk & Increase Productivity. You’ll gain insight into the evolution of effective contract management, the benefits of contract lifecycle management software, and best practices that apply across every industry.